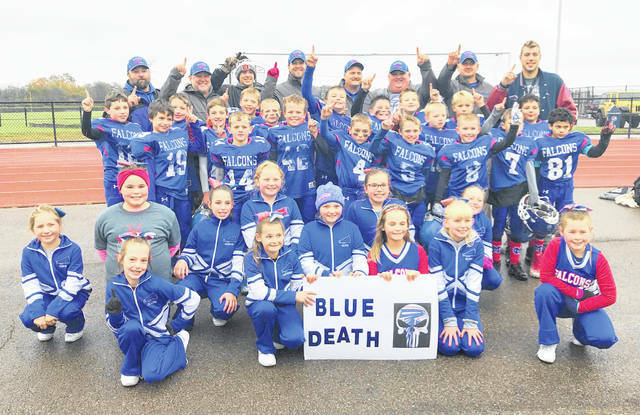 The Clinton-Massie fourth grade football team made it back to back championships with a 42-12 triumph over Brookville Saturday in the conference title game at Monroe High School. The young Falcons defeated Valley View 38-0 in the first round of the playoffs then Bellbrook 30-6 in the divisional championship match, which led to the game against Brookville. The Falcons were 10-1 this season and outscored its opponents 404-44. In the past two years, Clinton-Massie has a 21-1 record. In the photo, from left to right, front row, cheerleaders Jillian Arledge, Cheyenne Bailey, Olivia Smith, Kloie Updike, Olivia Hudson, Mackenzie Jeitz; second row, cheerleaders Abbie Fields, Jayai Hall, Heaven Werner, Alanna Ritchie, Grace Adams, Shelby Powell; third row, players Ryan Anderson, Micah Ruther, Cooper Fouch, Quinn McCoy, Wesley “Crazy Legs” Blankenship, Carter Fouch, Connor Musser, Ty “Curly” Martin, Luke Myers, Kaiden Smith, Corey Frisch, Peyton Warren, Greg Goings Jr., Christopher Back, Elias “Chipper” Robinette, Eli Sheeley, Cobe Euton, Terrell Brooks, Elijah Allen; back row, coaches Tony Anderson, Jason Frisch, Adam Frisch, Greg Goings Sr., Hilma Crawford, head coach Aaron Clutter, Justin Phipps, Seth Schmidt. Cheerleaders not pictured were Kaylee Jones and Kaylin Sanchez. https://www.wnewsj.com/wp-content/uploads/sites/22/2018/10/web1_FBY_cm4thchampions.jpgThe Clinton-Massie fourth grade football team made it back to back championships with a 42-12 triumph over Brookville Saturday in the conference title game at Monroe High School. The young Falcons defeated Valley View 38-0 in the first round of the playoffs then Bellbrook 30-6 in the divisional championship match, which led to the game against Brookville. The Falcons were 10-1 this season and outscored its opponents 404-44. In the past two years, Clinton-Massie has a 21-1 record. In the photo, from left to right, front row, cheerleaders Jillian Arledge, Cheyenne Bailey, Olivia Smith, Kloie Updike, Olivia Hudson, Mackenzie Jeitz; second row, cheerleaders Abbie Fields, Jayai Hall, Heaven Werner, Alanna Ritchie, Grace Adams, Shelby Powell; third row, players Ryan Anderson, Micah Ruther, Cooper Fouch, Quinn McCoy, Wesley “Crazy Legs” Blankenship, Carter Fouch, Connor Musser, Ty “Curly” Martin, Luke Myers, Kaiden Smith, Corey Frisch, Peyton Warren, Greg Goings Jr., Christopher Back, Elias “Chipper” Robinette, Eli Sheeley, Cobe Euton, Terrell Brooks, Elijah Allen; back row, coaches Tony Anderson, Jason Frisch, Adam Frisch, Greg Goings Sr., Hilma Crawford, head coach Aaron Clutter, Justin Phipps, Seth Schmidt. Cheerleaders not pictured were Kaylee Jones and Kaylin Sanchez.